My newest set is the Make a Mitten set and Builder Punch. I wasn't going to get this set and recently decided I had to own it! 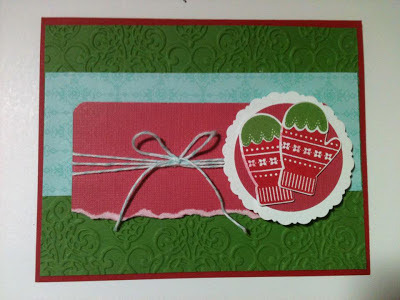 I used the Delicate Doilies Sizzlits L die to make the circle that the mittens are sitting on. Isn't it soooo cute?! I was in a "blah" moment and needed a sketch too so I popped over to Freshly Made Sketches and used their current sketch! I love it! Thanks to them! Please check out the other projects from the rest of the Design Team and welcome to our newest member Amy O'Neill! Very pretty card! I love the textured background and those adorable mittens! Thanks for playing along with my sketch this week at Freshly Made Sketches! I love your card Pan! That embossed background is stunning and those mittens are so cute! Thanks for joining us this week at Freshly Made Sketches! Love the torn edge! Thanks for playing with us at Freshly Made Sketches!